Encephalitis is an inflammation of the brain, usually caused by a direct viral infection or a hypersensitivity reaction to a virus or foreign protein. Brain inflammation caused by a bacterial infection is sometimes called cerebritis. When both the brain and spinal cord are involved, the disorder is called encephalomyelitis. An inflammation of the brain's covering, or meninges, is called meningitis . Encephalitis is an inflammation of the brain. The inflammation is a reaction of the body's immune system to infection or invasion. During the inflammation, the brain's tissues become swollen. The combination of the infection and the immune reaction to it can cause headache and a fever , as well as more severe symptoms in some cases. The viruses causing primary encephalitis can be epidemic or sporadic. The polio virus is an epidemic cause. Arthropod-borne viral encephalitis is responsible for most epidemic viral encephalitis. The viruses live in animal hosts and mosquitoes that transmit the disease. The most common form of non-epidemic or sporadic encephalitis is caused by the herpes simplex virus, type 1 (HSV-1) and has a high rate of death. Mumps is another example of a sporadic cause. Approximately 2,000 cases of encephalitis are reported to the Centers for Disease Control and Prevention in Atlanta, Georgia, each year. Encephalitis can strike anyone, at any age, although some kinds of encephalitis are more common in children. Other kinds of encephalitis can affect anyone, but may affect children more severely. Primary encephalitis is caused by direct infection by the virus, while secondary encephalitis is due to a post-infectious immune reaction to viral infection elsewhere in the body. Secondary encephalitis may occur with measles, chickenpox, mumps, rubella , and EBV. In secondary encephalitis, symptoms usually begin five to ten days after the onset of the disease itself and are related to the breakdown of the myelin sheath that covers nerve fibers. In rare cases, encephalitis may follow vaccination against some of the viral diseases listed above. Creutzfeldt-Jakob disease, a very rare brain disorder caused by an infectious particle called a prion, may also cause encephalitis. Mosquitoes spread viruses responsible for equine encephalitis (eastern and western types), St. Louis encephalitis, California encephalitis, and Japanese encephalitis. Lyme disease , spread by ticks, can cause encephalitis, as can Colorado tick fever. Rabies is most often spread by animal bites from dogs, cats, mice, raccoons, squirrels, and bats and may cause encephalitis. Equine encephalitis is carried by mosquitoes that do not normally bite humans but do bite horses and birds. It is occasionally picked up from these animals by mosquitoes that do bite humans. Japanese encephalitis and St. Louis encephalitis are also carried by mosquitoes. The risk of contracting a mosquito-borne virus is greatest in mid- to late summer, when mosquitoes are most active, in those rural areas where these viruses are known to exist. Eastern equine encephalitis occurs in eastern and southeastern United States; western equine and California encephalitis occur throughout the West; and St. Louis encephalitis occurs throughout the country. Japanese encephalitis does not occur in the United States but is found throughout much of Asia. The viruses responsible for these diseases are classified as arbovirus, and these diseases are collectively called arbovirus encephalitis. Herpes simplex encephalitis, the most common form of sporadic encephalitis in western countries, is a disease with significantly high mortality. It occurs in children and adults and both sides of the brain are affected. It is theorized that brain infection is caused by the virus moving from a peripheral location to the brain via two nerves, the olfactory and the trigeminal (largest nerves in the skull). Herpes simplex encephalitis is responsible for 10 percent of all encephalitis cases and is the main cause of sporadic, fatal encephalitis. In untreated people, the rate of death is 70 percent while the mortality is 15 to 20 percent in persons who have been treated with acyclovir. The symptoms of herpes simplex encephalitis are fever, rapidly disintegrating mental state, headache, and behavioral changes. Symptoms may progress rapidly, changing from mild to severe within several days or even several hours. A physician should be called whenever a headache does not respond to medication or when a person experiences a fever over 104°F (40.0°C), nausea and vomiting , visual disturbances, a stiff neck, or seizures. A doctor should be called when an infant's temperature rises above 100°F (37.8°C) and cannot be brought down within a few minutes. Infants whose temperatures exceed 102°F (38.9°C) should be sponge-bathed in cool water while waiting for emergency help to arrive. A brain biopsy (surgical gathering of a small tissue sample) may be recommended in some cases in which treatment has thus far been ineffective and the cause of the encephalitis is unclear. Definite diagnosis by biopsy may allow specific treatment that would otherwise be too risky. Choice of treatment for encephalitis depends on the cause. Bacterial encephalitis is treated with antibiotics . Viral encephalitis is usually treated with antiviral drugs , including acyclovir, ganciclovir, foscarnet, ribavirin, and AZT. Viruses that respond to acyclovir include herpes simplex, the most common cause of sporadic (non-epidemic) encephalitis in the United States. The symptoms of encephalitis may be treated with a number of different drugs. Corticosteroids, including prednisone and dexamethasone, are sometimes prescribed to reduce inflammation and brain swelling. Anticonvulsant drugs, including phenytoin, are used to control seizures. Fever may be reduced with acetaminophen or other fever-reducing drugs. A person with encephalitis must be monitored carefully, since symptoms may change rapidly. Blood tests may be required regularly to track levels of fluids and salts in the blood. Encephalitis symptoms may last several weeks. Most cases of encephalitis are mild, and recovery is usually quick. Mild encephalitis usually leaves no residual neurological problems. Overall, approximately 10 percent of those with encephalitis die from their infections or complications such as secondary infection. Some forms of encephalitis have more severe courses, including herpes encephalitis, in which mortality is 15 to 20 percent with treatment, and 70 to 80 percent without. Antiviral treatment is ineffective for eastern equine encephalitis, and mortality is approximately 30 percent. 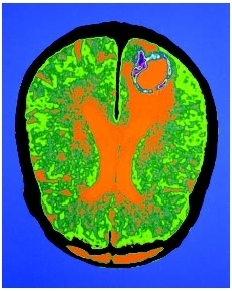 Computed tomography scan (CT scan) of a child with encephalitis. The right side of the brain shows abnormal dilation of the ventricles (orange). Permanent neurological consequences may follow recovery in some cases. Consequences may include personality changes, memory loss, language difficulties, seizures, and partial paralysis. Because encephalitis is caused by infection, it may be prevented by avoiding the infection. Minimizing contact with others who have any of the viral illnesses listed above may reduce one's chances of becoming infected. Most infections are spread by hand-to-hand or hand-to-mouth contact; frequent hand washing may reduce the likelihood of infection if contact cannot be avoided. Mosquito-borne viruses may be avoided by preventing mosquito bites. Mosquitoes are most active at dawn and dusk and are most common in moist areas with standing water. Covering skin and using mosquito repellents on exposed skin can reduce the chances of being bitten. Cerebrospinal fluid analysis —A laboratory test, important in diagnosing diseases of the central nervous system, that examines a sample of the fluid surrounding the brain and spinal cord. The fluid is withdrawn through a needle in a procedure called a lumbar puncture. Electroencephalogram (EEG) —A record of the tiny electrical impulses produced by the brain's activity picked up by electrodes placed on the scalp. By measuring characteristic wave patterns, the EEG can help diagnose certain conditions of the brain. Inflammation —Pain, redness, swelling, and heat that develop in response to tissue irritation or injury. It usually is caused by the immune system's response to the body's contact with a foreign substance, such as an allergen or pathogen. Vaccines are available against some viruses, including polio, herpes B, Japanese encephalitis, and equine encephalitis. Rabies vaccine is available for animals; it is also given to people after exposure. Japanese encephalitis vaccine is recommended for those traveling to Asia and staying in affected rural areas during transmission season. Adequate nutrition and fluids improve the chances for a full recovery from encephalitis. Parents should carefully monitor their infants and young children for symptoms of fever. Any fever that exceeds 103°F (39.4°C) for more than a few minutes should be promptly treated. Any complaints of a stiff neck, loss of consciousness, unexplained vomiting, or seizure activity should be promptly brought to competent medical attention. Halstead, Scott A. "Arbovirus Encephalitis in North America." In Nelson Textbook of Pediatrics , 17th ed. Edited by Richard E. Behrman et al. Philadelphia: Saunders, 2003, pp. 1086–8. Johnston, Michael V. "Encephalopathies." In Nelson Textbook of Pediatrics , 17th ed. Edited by Richard E. Behrman et al. Philadelphia: Saunders, 2003, pp. 2023–8. Nath, Avindra, and Joseph R. Berger. "Acute Viral Meningitis and Encephalitis." In Cecil Textbook of Medicine , 22nd ed. Edited by Lee Goldman, et al. Philadelphia: Saunders, 2003, pp. 2232–5. Tyler, Kenneth L. "Viral Meningitis and Encephalitis." In Harrison's Principles of Internal Medicine , 15th ed. Edited by Eugene Braunwald et al. New York: McGraw-Hill, 2001, pp. 2471–80. Arciniegas, D. B., and C. A. Anderson. "Viral encephalitis: neuropsychiatric and neurobehavioral aspects." Current Psychiatry Reports 6, no. 5 (2004): 372–9. Cunha, B. A. "Differential diagnosis of West Nile encephalitis." Current Opinions in Infectious Disease 17, no. 5 (2004): 413–20. Lyle, P., et al. "Evaluation of encephalitis in the toddler: what part of negative don't you understand?" Current Opinions in Pediatrics 16, no. 5 (2004): 567–70. Morgan, R. "West Nile viral encephalitis: a case study." Journal of Neuroscience of Nursing 36, no. 4 (2004): 185–8. Savas, L., et al. "Full recovered meningoencephalomyelitis caused by mumps virus." European Journal of Neurology 11, no. 9 (2004): 639–40. American Academy of Neurology. 1080 Montreal Avenue, St. Paul, MN 55116. Web site: http://www.aan.com. American College of Emergency Physicians. PO Box 619911, Dallas, TX 75261-9911. Web site: http://www.acep.org/. "Arboviral Encephalitides." Centers for Disease Control and Prevention. Available online at http://www.cdc.gov/ncidod/dvbid/arbor/ (accessed January 5, 2005). "Encephalitis." Mayo Clinic. Available online at http://www.mayoclinic.com/invoke.cfm?id=DS00226 (accessed January 5, 2005). "Encephalitis." MedlinePlus. Available online at http://www.nlm.nih.gov/medlineplus/encephalitis.html (accessed January 5, 2005). "Encephalitis." World Health Organization. Available online at http://www.who.int/topics/encephalitis/en/ (accessed January 5, 2005). Encephalitis Information Resource. Available online at http://www.encephalitis.info/ (accessed January 5, 2005). "NINDS Encephalitis and Meningitis Information Page." National Institute of Neurological Disorders and Stroke. Available online at http://www.ninds.nih.gov/health_and_medical/disorders/encmenin_doc.htm (accessed January 5, 2005).